Let me do a quick disclaimer - this is not my recipe. I wish it were my recipe, but it's not. It has been a hit repeatedly though, and I've had holidays on my mind (that is what happens when you live in Seattle in September) - I love holiday parties - this is a great cake to share with friends. It's beautiful and delicious. Preheat oven to 350 degrees F and butter spray a pan. 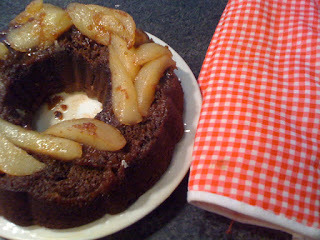 I like using a bundt pan, but you don't have to do that. 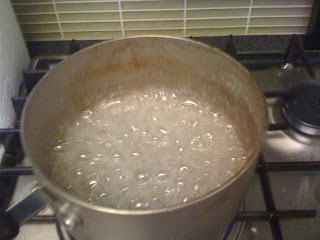 Take the first cup of sugar and 1/4 cup water and stir in a saucepan until it dissolves over heat. Bring to a boil, cover, and leave alone for 2 minutes.Uncover the pan, using a brush, wash down the sides of the pan and continue stirring the mixture until it becomes a dark amber color. You will have to wash down the sides of the pan repeatedly. Keep a careful watch over it. 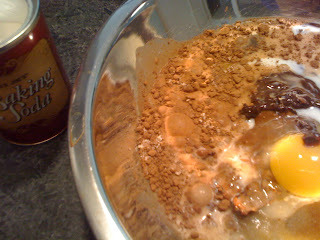 Remove from heat when it looks the color of caramel. No good recipe for an upside down cake would be complete without an upside down photo. Take the sliced pears and fan out on the bottom of the pan. I only had two this time, which ended up fine - but I like pear and three is a much heartier number. Pour the caramel over the pears. Leave to sit while you get on with the rest of the recipe. Fill the saucepan with water and put back on heat. Bring to a simmer. Take the unsalted butter and chocolate and mix in a heat-proof bowl fitted over the pan until melted. You can use dark or semi-sweet chocolate. Dark is really decadent, depends on the crowd and the general taste for chocolate. I like both ways. 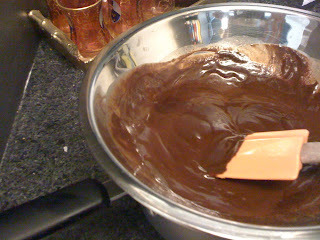 Remove from heat once the chocolate becomes glossy. Take all the other ingredients: flour, cocoa powder, baking soda, salt, 3/4 cup sugar, eggs, vanilla, and milk and dump into bowl. Add the melted chocolate and mix well. 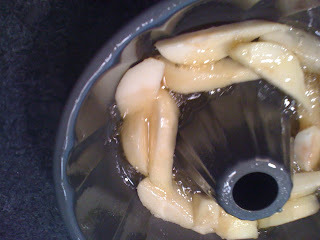 Pour the chocolate batter over the caramel and pears. Bake 40-45 minutes. You'll love it. Chocolate and Pear - My favorite combo. omg, i want this! i'm definitely going to try it out. thanks! I absolutely adore the flavours you use.